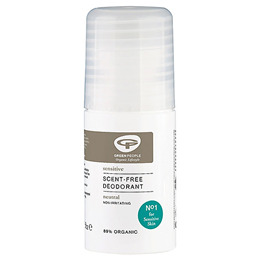 Below are reviews of Green People Organic Base No Scent Roll on Deodorant - 75ml by bodykind customers. If you have tried this product we'd love to hear what you think so please leave a review. I have used Green People deodorant for several years and find it excellent, kind to the skin, and does what it says. I have also used their Rosemary scented one but prefer scent free. I have bought various Green People products over the years and all have been great. Unfortunately this deodorant did not work for me. Showered in the morning, applied GP deodorant and by late afternoon I could smell BO. To my embarrassment, it was me. I have hypothyroidism - one symptom is that I hardly sweat - but I still like to be sure and that is why I still use a deodorant.